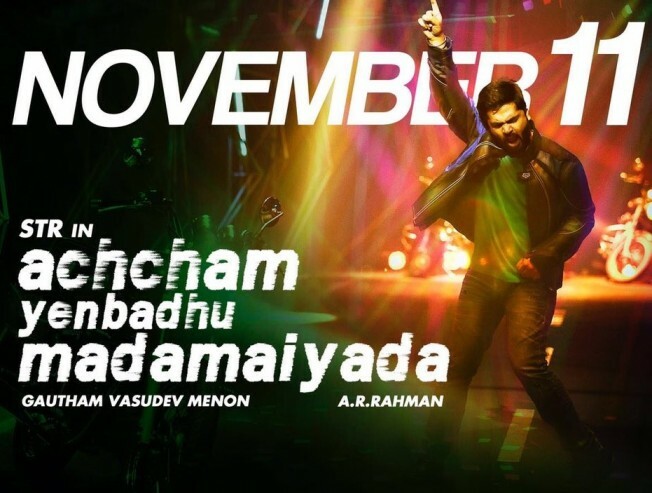 Achcham Yenbadhu Madamaiyada from November 11! STR's highly awaited movie under Gautham Vasudev Menon's direction - Achcham Yenbadhu Madamaiyada (AYM) is all set to hit screens on November 11. Produced by Gautham Menon himself under the Photon Kathaas and Ondraga Entertainment banners, this movie has Manjima Mohan playing the female lead. The songs composed by AR Rahman have already been topping the charts and created a lot of expectations for the movie. Baba Sehgal and Daniel Balaji play important roles in AYM. Have you booked your tickets for the movie yet? >>Marvel Anthem By AR Rahman Official Video Is Here!